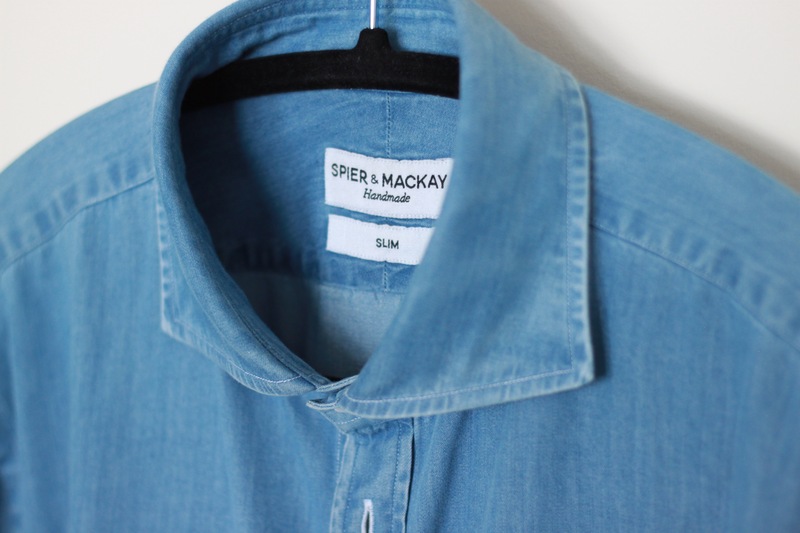 Denim Dress Shirt - Oxymoron? Texture. But not so much in the physical sense, more from a visual standpoint. As it ages, denim wears along stitching and edges that produces some great character. I’m quite a fan of textured solid fabrics, and denim is no exception. I don’t often wear suits anymore, and prefer to stick to odd trouser and sport coat combinations. In this regard, a denim dress shirt adds some visual interest without being too incongruent. We’re talking dress shirt construction of a fabric that just happens to be denim here, not a full-on western shirt with pearl snaps and heavier, dark denim. I think the denim dress shirt is a well-balanced blurring of lines. 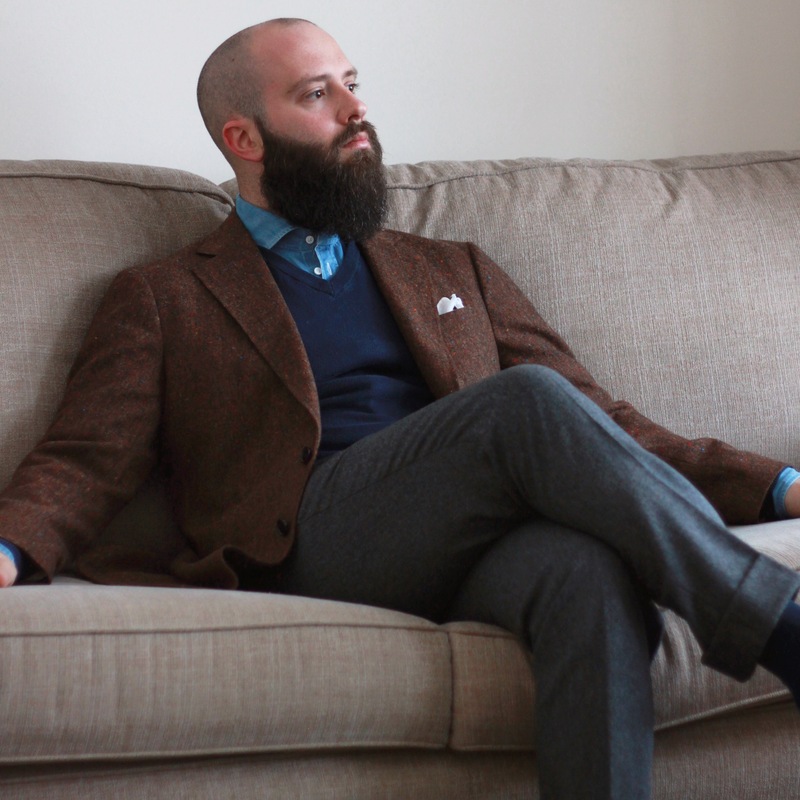 That being said, I still prefer to loosely apply similar guidelines to pairing a sport coat with denim. Texture – ideally it should have enough to stand up with the denim. Tweed is great. Wool/linen blends are great. Something less formal than worsted wool. Pattern – if you don’t get texture, then pattern is a must. If you have pattern and texture, all the better! This is a good opportunity to wear something that might be hard to pair in a more formal getup. Colour – something to contrast with the denim. Light wash? Dark jacket. Dark wash? Medium or light jacket. I like browns, greens and greys with denim. Shades of blue can be tricky – we’re looking for contrast here. 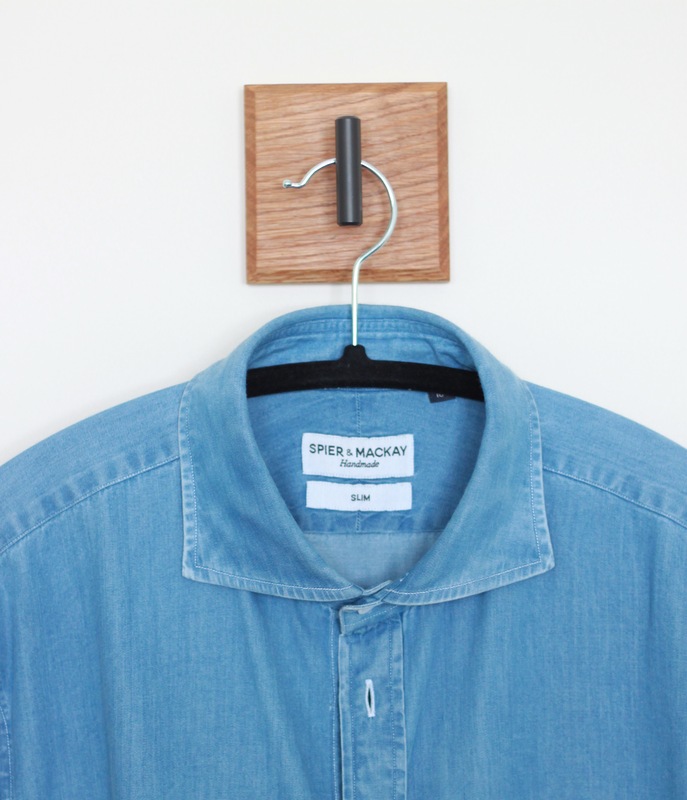 Right now, I have a single spread collar medium wash denim shirt. Another way to balance the formality would be to go with a button-down collar. A button-down collar shirt worn open under a sport coat will always have a nice smart-casual feel to it. I really like the colours in this outfit. I think the saturated blue of the denim shirt works well here. 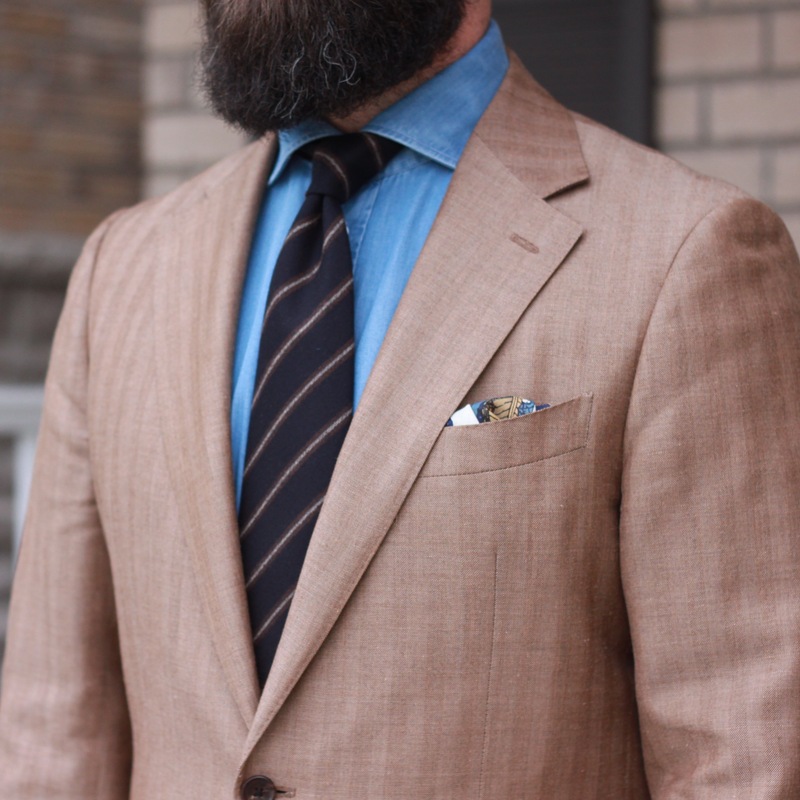 Though I chose a lightly textured sport coat, the overall look of this tan herringbone is relatively smooth. 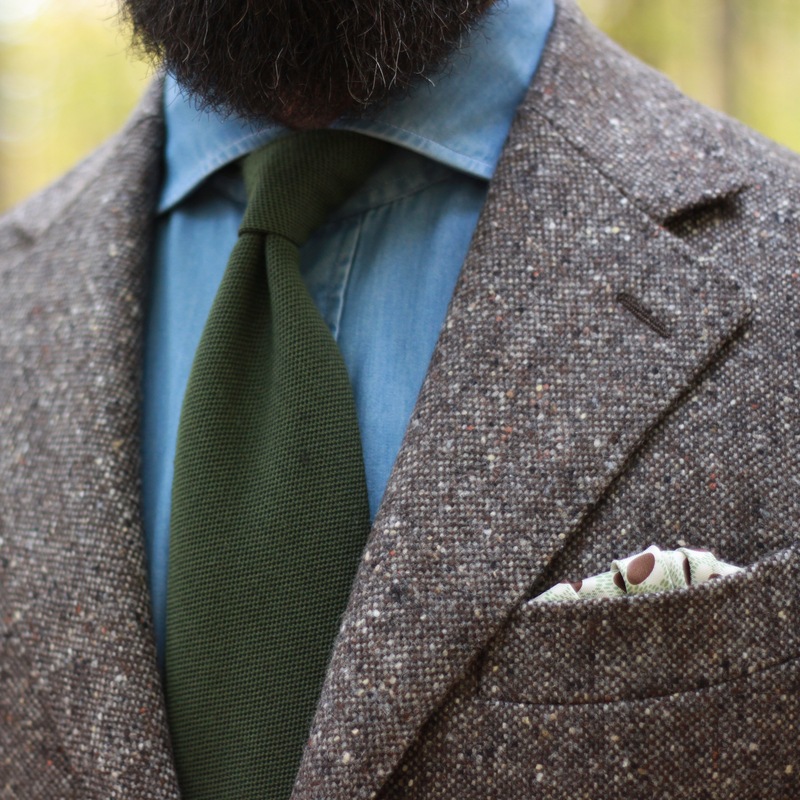 Combine that with the soft texture of my Vecchio Anseatico tie, and the denim shirt looks a bit out of place. A similarly toned blue dress shirt would have been the more coherent choice. Here, I wanted to try my hand at the denim on denim base. I think it worked out ok. The grey cardigan doesn’t add anything in terms of contrast or texture. 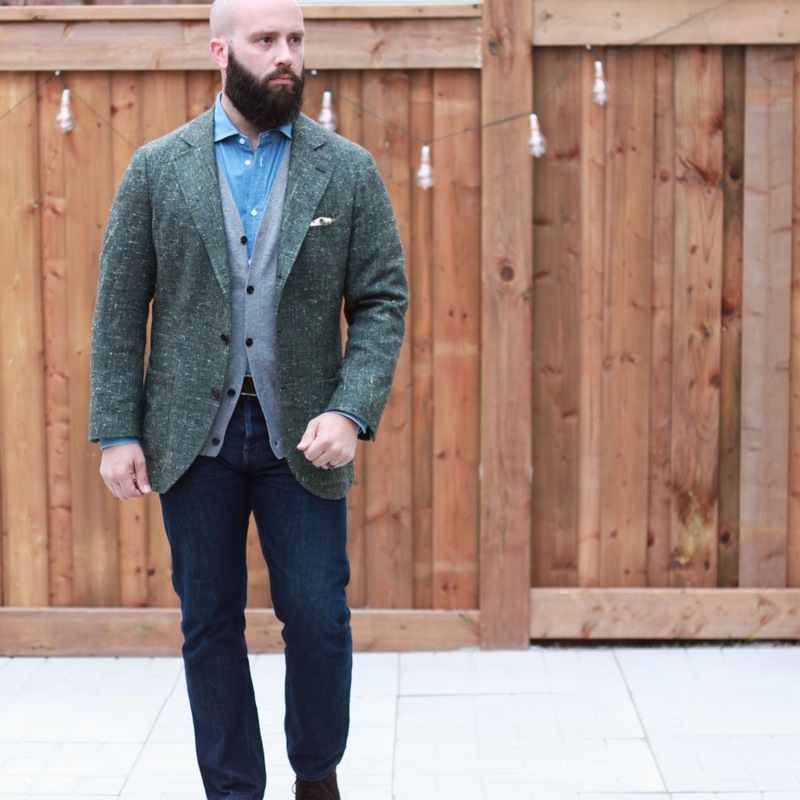 The green slubby jacket doesn’t add enough contrast either, though the texture is perfect for pairing with denim, I may attempt a denim on denim look again with my new Donegal-style tweed jacket that is a beautiful warm, rusty brown. I think this outfit is a great example of how to wear a denim dress shirt. The barleycorn weave of this natural, un-dyed Donegal tweed is great – nails the texture and contrast, and the multi-coloured flecks add some visual weight like a pattern would. 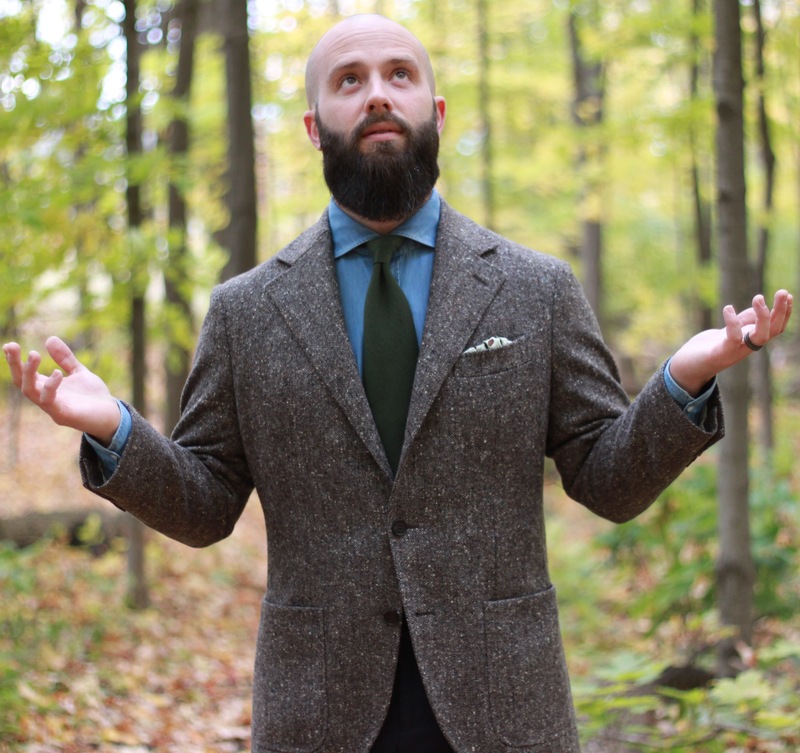 The tie I chose here is a really cool textured wool from Hickey Freeman that I scored on LuxeSwap. The bottom half was navy trousers that provide additional contrast. I had to update this post with this shot. It was inspired by Simon from Permanent Style and a post of his on Instagram. I liked the denim shirt under a navy v neck sweater and a warm brown tweed sport coat. The grey flannels down below are a great lower contrast choice. This medium wash denim dress shirt has been a great first start. At some point, I’d like to add a true light wash spread collar into the rotation, along with a dark rinse button down. What are your thoughts? Is it a menswear abomination, neither here nor there? Or is it a reasonably versatile piece that should be in anyones’ closet? Let me know in the comments. Thanks for sharing! You included some great history of denim. Great read! Glad we’re on the same page.